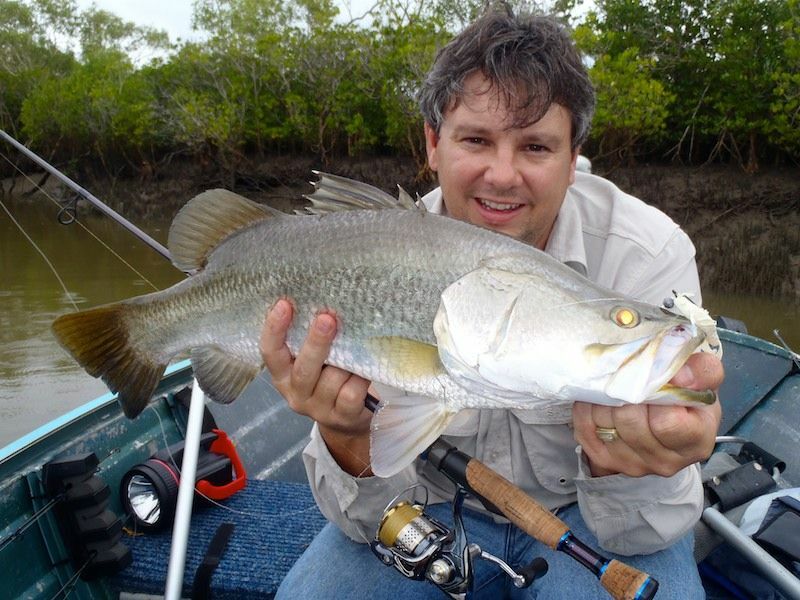 Went into Morrissey's Creek yesterday morning to chase some more Barra on lures. 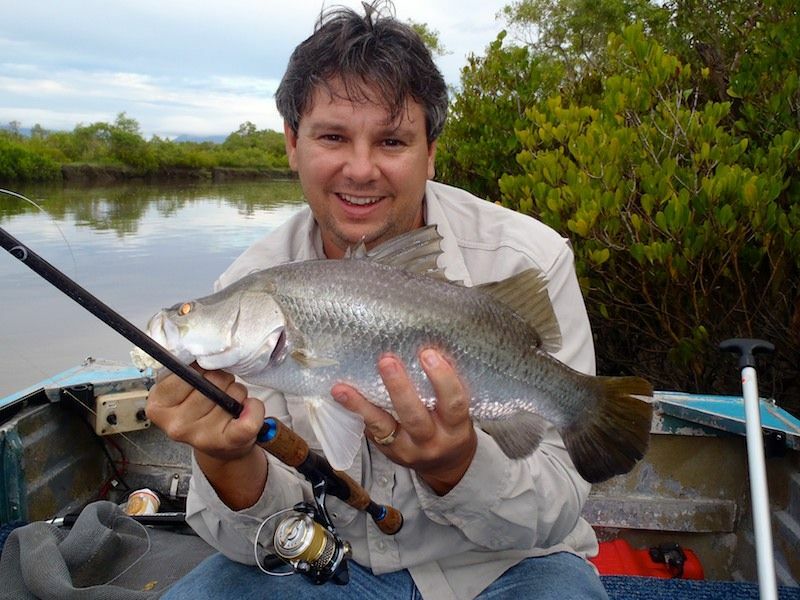 The Barra have been going off ever since the season opened, but as usual I have only managed to nail a few to date. I was super keen to tangle with something big! We got to the ramp very early, right on first light. Plan was to run up river a fair way and try to catch the turn of the top of the tide. It was a long run in a little boat, and the sun was just starting to get some more light to it when we arrived. Ideal Barra time! Down when the electric and...whats this!!! Left is stuck on! Oh no... So the next half hour was wasted with my trying to pull the foot controller apart with a knife to get it functional again. Last time I had a button stuck it was just a small bit of grit that got in the way. But not this time. Looks like a spring inside the switch was squashed and not pushing the button back up again. I manage to get the tiny switch apart and stretch the spring hoping it would get it functional again. But when all was looking about right the spring sprung off and went flying! Just my luck. The tiny spring was gone and so was any chance of getting the thing going again. We prodeeded up stream past where we intended to fish and drifted along casting lures. It reminded of the time before having the electric fitted. But the tide and wind just wouldn't play the game. We were continually having to start the main motor to get us off the back. Not ideal. We were both fishing hard bodied lures hoping for one the bigger fish. But without so much as a nudge it was time for the plastic fantastic! Second cast with the white 3in prong and I was on! 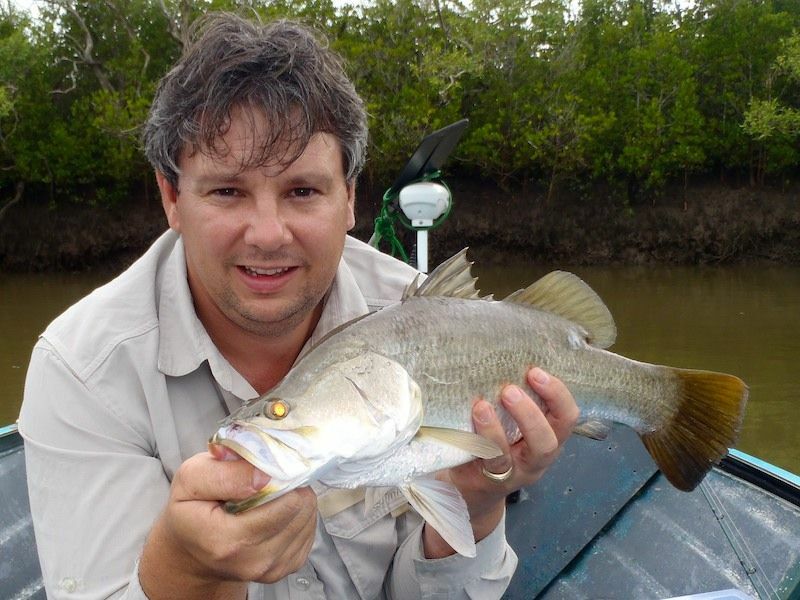 A solid little rat barra that put up a great fight on the Stella 1000 and 8lb. But he was easily contained and led to the net. Amazing how successful the prongs are. Getting ever more frustrated by not having the electric Dad comes up with a great idea. "how about we rig up a paddle to the head and use it like a tiller". Great idea. I rigged it up to use the paddle to turn the motor and then just the foot controller for power. While not ideal, it ended up getting us out of trouble! 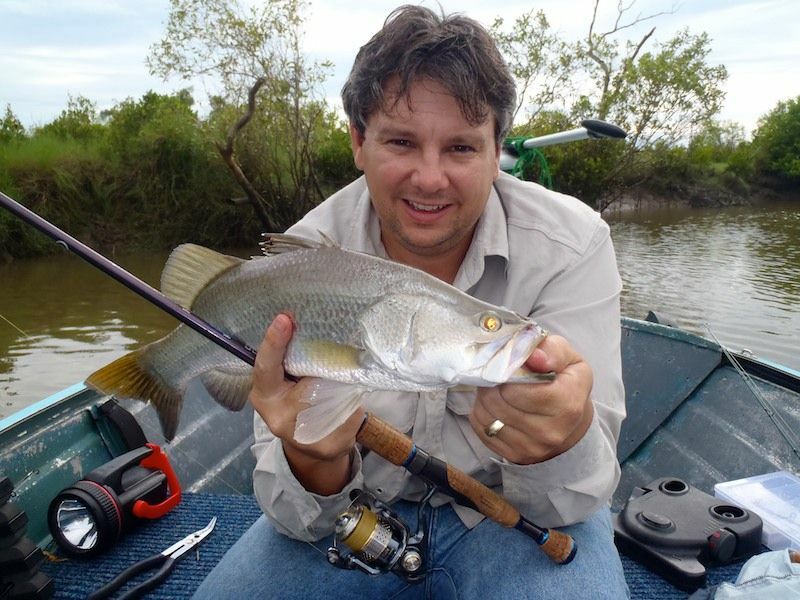 We continued fishing the prongs in the timber for 2 more Rat Barra and then finally one that went 60cm. This fish came off a set of snags in the middle of the creek. Not the big girl we were hoping for, but one for the eski! I also managed a 38cm Jack and Dad a nice fat Pikey Bream. Despite the rain during the week Morrissey's was running quite clear. Far better than the reports I have had from the Haughton.